Fantastic, awesome, inspirational, you rock! Thanks Janene! I still can’t really believe I did it today! However the sunburn, chafing, sore feet and tight muscles tell me otherwise!! It’s been 8 years since my last tri. I hope you are able to get a good recovery massage, you have earned one! I will wait a few days. 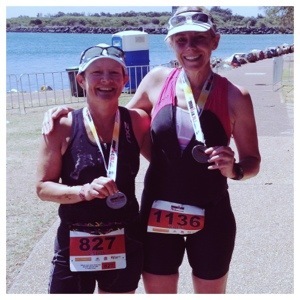 Sunburn & chafing – a bit sore with tender spots! Well done, time to rest & reflect. No reflecting. Wouldn’t do anything differently & don’t plan on doing another one for a while. Just relaxing! Very happy with my effort today. I’m so happy for you and proud of you. Your dedication, commitment and consistency to your training through the cold winter months inspires me. Thanks Jen! I’m looking forward to a good nights sleep, then checking out more of Port’s cafes & generally just relaxing. Way to go girl … excellent time, especially with hills on the ride … very impressed! Thanks Jeff. I’m really happy with how I went. At the time I thought “never again” but…well, you never know!